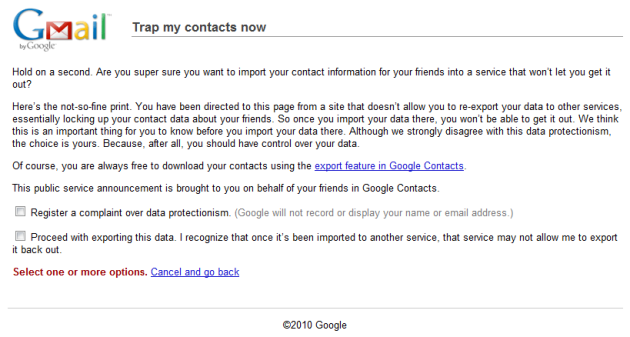 As I’m sure you’ve learned by now, Google recently blocked Facebook API access to download Google contacts. Facebook hacked its way around that, and Google subsequently issued a statement that they were “disappointed”. Facebook Platform engineer Mike Vernal then responded in the comments of one of our blog posts about the slap fight, defending Facebook’s policy and calling it – cough – “consistent”. And the battle of the Web giants continues. [_] Proceed with exporting this data. I recognize that once it’s been imported to another service, that service may not allow me to export it back out. 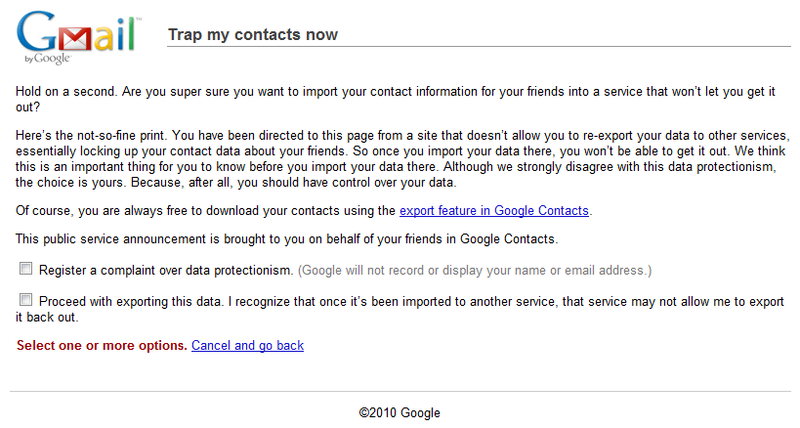 Yes, that’s Google explicitly warning you that your contacts information will be effectively trapped inside Facebook without the ability to re-export the data, and giving you the option to register a formal complaint over data protectionism (to what end remains unclear). For the record, they’re still letting you go on with exporting the data if you please. Which unfortunately means a lot of Facebook users will probably do exactly that before reading the warning and understanding the message Google is trying to convey.